One of the joys of car-free walking is making up your own routes. Rather than sticking to a well-trodden path, or a particular peak, you can select two stations or bus stops – one to start and one to finish – and make up the bit in between. With this cunning plan in mind, I spread out my maps of the Yorkshire Dales and started scanning. The problem with the Dales, though, is where to start? There are several train stations around the south and western sides, and good bus services through all the major dales, which means the whole park is easily reached without a car. The Three Peaks – Ingleborough, Whernside and Pen-y-ghent – were demanding a second visit, and Wensleydale boasts some of the finest walking in England. 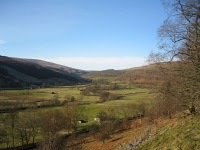 Or what about exploring a less familiar valley – Raydale, Wharfedale or Dentdale? Time for Plan B. A brief check on the Trainline found cheap rail tickets from London to Gargrave, so that was the starting point. And a friend had recently spent a night at Grinton Lodge in Swaledale while cycling the Coast to Coast path; for want of a more noble reason that would be my end target. So, south to north across the best part of the National Park. As for the bit in between? Well, I could make it up. Gargrave was bright and sunny upon arrival, and after stocking up on supplies (I had eaten my emergency chocolate on the train), a brisk amble along the Pennine Way took me to Malham. No time to visit the famous cove before darkness fell, so instead I made for the Lister Arms, maps at the ready to plan the next day’s route. Unfortunately, three pints of Thwaites’ Nutty Black scuppered any attempts at forward planning and I was soon tucked up in bed – at least I got an early night. The stars were still out when I left the hostel and headed towards Gordale – with the next night’s bed in far-off Wensleydale, I needed to keep up a steady pace. 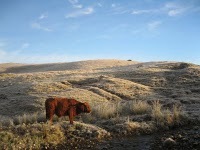 A herd of cows huddled together in a field, the morning frost clinging to their shaggy brows. They watched me pass in my hat and gloves, envious of these warming garments. But in my eagerness for an early start, I had forgotten that Yorkshire gets a bit chilly in November. The rocks and boulders that jostle around the foot of Gordale Scar were coated with a thin but treacherous layer of ice, and the stream was bursting down the waterfall – evidence of the recent heavy rains. After two short-lived attempts to scramble up, and two soggy boots from rapid downclimbing, it was time to change plan and head up via New Close Knotts. Even this was far from simple; the Dales’ distinctive limestone scars are steeper than they look from the valleys. A stone kicked down by a stray left boot bounced down to the valley floor; I took extra care over the final few feet to make sure I didn’t follow it. If the early bird catches the worm, then the early walker gets the hills to himself. For the three hour hike to Arncliffe, I could enjoy the moors in blissful solitude, the frozen ground crunching beneath my feet. Along with three ascents, six tea breaks, and two slips, my route took me through four different dales – Littondale, Wharfedale, Raydale and Wensleydale. Crossing them in succession is more tiring than exploring one dale in a day, but added fascinating variety as each has its own distinct character. The bustling, tourist-loving Wensleydale contrasted with the hidden and elusive Raydale; Wharfedale was bustling with birds flitting along the river, collecting the last berries of autumn, while the sheep on the moors above Littondale huddled together behind a wall to shelter from the biting November wind. After a refreshing overnight stay the Rose & Crown in Bainbridge, legs were fully restored from the 22 miles of the previous day and I set off at the more reasonable hour of 9.00am. 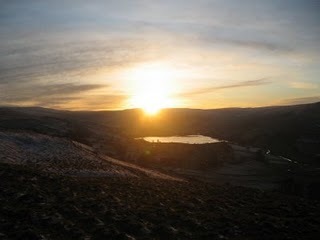 The final day’s route headed across the grouse moors that rise up above Wensleydale, and head into Grinton in Swaledale. Grouse – and the associated shooting industry –dominate this part of Yorkshire. Grouse butts run in lines all over the moor, and every few footsteps would send one of these clumsy black birds into a whirring, stumbling flight over the moor, accompanied by a series of panicked squawk. They have every right to be scared – shooting is still big business round here. Graceless they may be, but that’s still no reason to blast them. 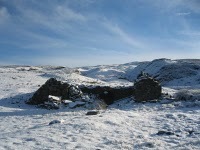 The frost had given way to snow on this higher ground, hiding the many bogs, streams and frozen ponds that scatter these moors, and I was cold and a little weary upon arrival in Grinton. Like all good walkers, I headed straight for the Bridge Inn, much vaunted by my coast to coast cycling friend. Several of the punters enjoying their Sunday lunch gave me disdainful looks – they hadn’t expected this snowy, hairy and sweaty intrusion to their dinner. Fortunately the landlord’s father – doing an emergency shift behind the bar – was more welcoming. A keen walker himself, we were soon chatting at the bar about the moors above the village, life in Swaledale, and the history of Grinton. And as the unfriendly diners drifted away, my reward for three days of braving the elements presented itself – the fireside chair. Settling back, toes stretched towards the flames, and pint at hand, I could look back on a job well done – forty miles, five different dales and several pints of Yorkshire bitter. The final effort was to move my aching limbs from the fireside chair and climb up the hill to the Lodge – the hardest part of the whole trip. Gargrave Station is on the Leeds-Carlisle line, easily reached from either end. Getting back from Grinton involves taking theDalesbus from Grinton to Richmond, and onto Northallerton for the nearest train station. Richmond makes a nice stop for a pot of tea if you have to wait while changing buses. Lots of options in each of the Dales - the ones mentioned in this blog were all very cosy and friendly, but better to make up your own Dales' route -there are loads of great places to relax after a day's walk!